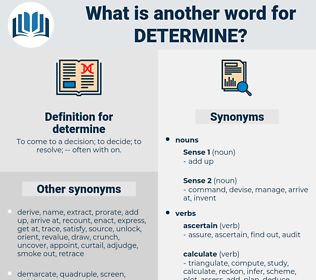 What is another word for determine? To come to a decision; to decide; to resolve; -- often with on. ascertained, assess, identify, identifying, ascertainable, definite, definitive. limits, facts, assess, identify, identifying, identification. assessments, minds, purposes, courses, positions, options, Charges, types, Operators, cases. assess, Ascertaining, identify, discuss, identification. Examined, dictated, considered, addressed, tested, satisfied, used, assess, identify, identifying, estimated. Delineating, deciding, Characterizing, Eliciting, charting, identifying. are, dictate, assess, govern, prescribe, shape, adjudicate, characterize, judge, elect, affect, deem. examines, demonstrates, directs, depends, becomes, identify, identifying. deciding, dictate, elucidate, quantify, Chose, delimit, assess, stipulate, analyze, redefine, govern, demarcate, seeing, uncover, prescribe, appreciate, diagnose, determinate, inquire, shape, inform, adjudicate, impose, characterize, appoint, judge, interpret, arrive, substantiate, prove, construct, validate, identification, nominate, classify, elect, be, affect, capture, deem, quantitate, elicit. pinpoint, discern, delineate, determination, infer, identify, distinguish, trace, discuss, regulate. dissuade, hinder, bear, waver, overlook, doubt, discourage, miss, initiate, start, prevent, hesitate, begin, repress, suppress, commence, stop, create. let go, follow, neglect, mismanage. hang on, protract, equivocate, hedge, vacillate, pass over, persist, muddle, waffle, stall, decline, delay, skirt, draw out, reject, abstain, extend, halt, pussyfoot, refuse, muddy, temporize, misplace, prolong, Misset, turn down, continue, mislay, lose.
" The court in this proceeding will finally determine the issue. My examination was hasty, but enough to determine that he was drowned; death was really due to that. dormie, dethrone, darwinian, dairyman, derain, darn, dormy, drum, deuterium, dry run, dramamine, dreamy, drain, daydream, detrain, drone on, drone, drawn, dew worm, draw rein, dream, draw in, durian, dirham, darwin, dead room, deuteron, deuteronomy, dehorn, durion, dorian, Drome, doorman, dorm, dharma, duramen, Dharhan, drown, dram, diorama, durum, derma, durham, diathermy, drama. narrow down, specify, narrow, peg down, nail down, pin down. 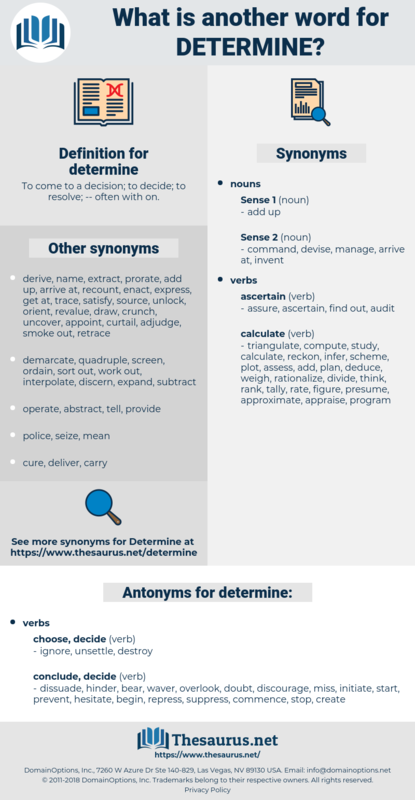 delimit, delimitate, specify, define, delineate.